Are Girls Who Get Their Periods Early Just Low On Vitamin D? Girls have been starting their periods younger and younger, and scientists aren't exactly sure why. Previously, doctors said weight, race, exposure to chemicals, or sexual abuse could be to blame, and now a new study suggests vitamin D deficiency may be the culprit. University of Michigan researchers followed 242 girls ages 5 to 12 from Bogota, Colombia for 30 months. 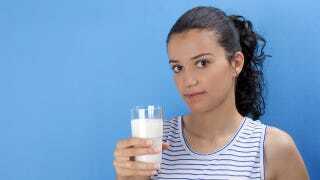 They found that those who were low on vitamin D were twice as likely to start menstruating during the study. Previous research suggested that girls who live close to the Equator start menstruating later than girls who live in northern countries. It's possible that this is because girls who live in colder climates get less sun exposure and have higher rates of vitamin D deficiency.